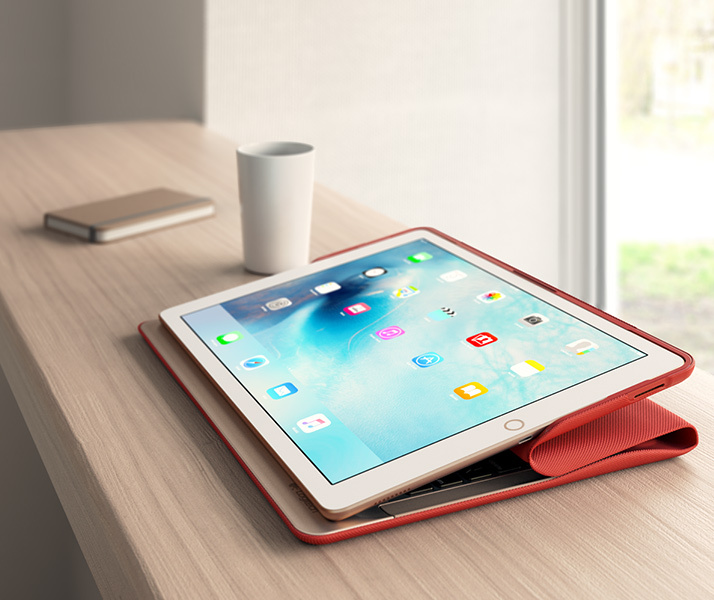 Logitech Create is a keyboard case that provides all-around protection for the iPad Pro. The case uses a water-repellent fabric with a synthetic weave and feels very secure. The buttons on your iPad Pro are all covered and the overlap buttons actually make them easier to press. The extra protection and keyboard does make for a rather heavy case and adds quite a bit of thickness to the otherwise thin iPad. By itself, the case weighs about 426g (for the case that’s compatible with the iPad Pro 9.7 inch). There’s also a special cutout for you to slot your Apple Pencil, which can be handy as it is otherwise easily misplaced. The Create keyboard keys are smaller and also spaced together, especially since I am using the 9.7″ iPad Pro, but the keys themselves are adequately raised with a nice tactile feel. Once accustomed to the size of the smaller keyboard, typing speed can be quite fast as the keys are really responsive, well, for a chiclet style keyboard. What’s even better? Backlights. Thanks to the smart connector system which allows it to use the juice from your iPad Pro, the Create keyboard comes with backlights to allow you to type in the dark. No need to turn on that too bright reading lamp on board a redeye flight when you still need to get some work done. There’s only one fixed position for typing. Which means what’s perfect for typing on a normal table / chair setup doesn’t translate too well when you are balancing the tablet on your knees. Although to Logitech’s credit, the case is rather stable once propped up. If you don’t need the keyboard, there’s another flatter angle that you prop up the tablet, which is more suited for use with the Apple Pencil. If you have an iPad Pro and are expecting to do quite a fair bit of typing on it, the Logitech Create backlit keyboard is really a good choice. That is, if you can bear to part S$219 for it, the usual – buy on Qoo10 and apply coupons for an effective 10-20% discount. The Logitech Create keyboard unfortunately doesn’t come cheap.